Before they even hit a chord, ROYAL SOUTHERN BROTHERHOOD have your attention. In the US South, where music is religion, two rock ‘n’ roll bloodlines tower above all others. In the saloon bars from Mississippi to Maryland, mere mention of the Allman and Neville Brothers casts a magic spell. Conversation falls silent. Pool balls stop rolling. Ten-gallon hats are tipped in respect and beer-bottles raised in salute. 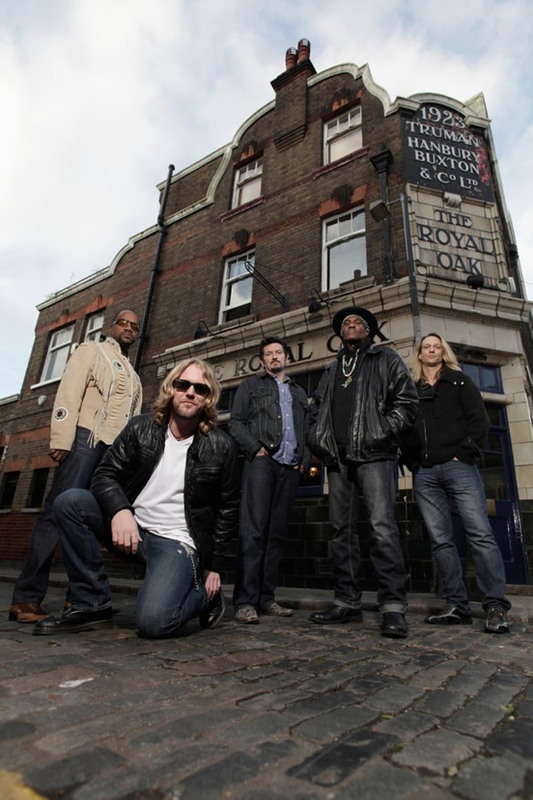 These aren’t just bands, they’re gods, and with a lineup comprising both the iconic Cyril Neville and Devon Allman, Royal Southern Brotherhood come pre-loaded with expectations. Don’t worry: they can match them. The family tree might be auspicious, but this new band trades on talent, not genealogy. It’s not about rock history: it’s about the here-and-now. Right now, the buzz is all about Royal Southern Brotherhood’s debut album, bottled with producer Jim Gaines in Louisiana. But let’s rewind to the summer of 2010 and the stifling heat of New Orleans: the city that both hosted the Allmans’ early residence as house band at The Warehouse, and provided the backdrop to the pivotal meeting between Cyril, Devon and Mike Zito. Talk turned to forming a new breed of blues-rock band, and when jams began at a secluded studio in the city’s Garden District, the fizzing chemistry was too strong to deny. A fistful of demos hinted at the project’s potential, and the web buzzed as a volley of teaser videos hit YouTube, but Royal Southern Brotherhood truly arrived when they broke cover in the flesh at their debut show at New Orleans’ Rock ‘N’ Bowl last September. This was southern rock, but not as we knew it, as tumbling three-part harmonies and hickory-smoked guitar riffs weaved together both families’ styles with added rocket-fuel. The crowd reaction said it all: Royal Southern Brotherhood had crashed the rock scene like a wrecking ball. This lineup has talent to burn. You’ll already know Cyril Neville: poet, philosopher, percussion master and perhaps the South’s last great soul singer. At 63, this is the latest chapter in a career that began with 1970’s debut solo single, Gossip, and his touchdown in the lineup of older brother Art’s funk outfit, The Meters, who had already hit big with 1969’s immortal Cissy Strut. Cyril lent percussion and vocals to classic albums including 1972’s Cabbage Alley and 1975’s Fire On The Bayou, and when über-fan Mick Jagger invited The Meters to open the Rolling Stones’ stadium tour of 1975, he suggested Cyril took vocals (they agreed). Post-Meters, he’s been key to the rise of The Neville Brothers, created alchemy with Bob Dylan, Bono and Willie Nelson, toured with funk act Galactic, led his solo band Tribe 13, and made TV appearances on Jimmy Kimmel Live! and HBO’s Treme. It’s one hell of a CV… but he’s only just getting started. Likewise Devon Allman. As the son of Gregg Allman, the 36-year-old has rock ‘n’ roll in his DNA, but he’s always walked his own path. Growing up apart from his father in St Louis, MO, and refusing to trade on his celebrity surname, Devon’s formative influences took in everyone from The Beatles to KISS, while his early bands ran the musical gamut rather than echo the Allmans. In 1999, he hit the radar as leader of Honeytribe, whose fearless albums announced him as a next-generation guitar hero, but by his thirties, the pull of his Southern heritage couldn’t be denied, and he willingly fell into the soul-drenched blues-rock style that recalls his key influences, Carlos Santana and his uncle Duane Allman, while making his own mark. In the last seven years, Devon has plotted an old-school ascent, crossing 14 countries on tour, blowing the roof off a new venue each night, and watching as fans and heroes alike fall under his spell. There’s been a Top 10 hit in Spain with Javier Vargas, albums alongside Jack Bruce, jam sessions with heavyweights like Les Paul and Billy Gibbons, even the launch of his own signature amp with Fuchs Audio Technology. When Devon takes the stage – either with Honeytribe or during cameos with his father and the Allmans – fans are wowed by a guitarist who can be smooth, savage or seismic, but it’s in Royal Southern Brotherhood that you’ll hear this modern master playing at full-throttle. Not many guitarists could stand toe-to-toe with him. Step up Mike Zito: the blues ace whose ear for melody provides the counterpoint to his wingman’s rocking tendencies. Nominated in 2011 for the Blues Music Foundation’s ‘Best Blues Rock’ award, and winner of 2010’s Blues Music Award for ‘Song Of The Year’ with the title track of Pearl River (a co-write with Cyril Neville), few stars are rising faster. As former St Louis circuit-mates and friendly rivals, Devon and Mike have history, and while the guitarist has known trials in his life – just listen to 2011’s award-nominated Greyhound album for an account of the addictions that left him homeless in Florida – Royal Southern Brotherhood finds him long-term sober and with soul flowing through his fingers. But like Cyril says, it’s all about making “a good gumbo”, and that’s where God’s own rhythm section comes in. Giving Royal Southern Brotherhood its hip-shaking groove are bassist Charlie Wooton and drummer Yonrico Scott: both heavyweight names in their own right, with Charlie’s bass chops celebrated on the Southern jam scene for his sets with the Woods Brothers, and Yonrico hitting the skins for luminaries including the Derek Trucks Band, Gregg Allman and the Allman Brothers themselves. When these five stellar musicians come together as Royal Southern Brotherhood, the planets align. They said that rock ‘n’ roll was dead, but they were wrong. Right now, in 2013, there’s something in the air, as Royal Southern Brotherhood drag their thrilling new brand of blues-rock and white-hot musicianship from the Southern States onto the world stage. The South is rising again. Come along for the ride.